On this page I shall put daft shots I have taken. I expect that most, perhaps all, of these will be taken with my new digital camera which I keep in my pocket as a tool of opportunity. I was in a church hall, and noticed that on a pin board on one wall was a display of posters that the Sunday school children had made. They all had the same theme: that drugs are bad and that people shouldn't take them. The headline on this particular poster caught my fancy. 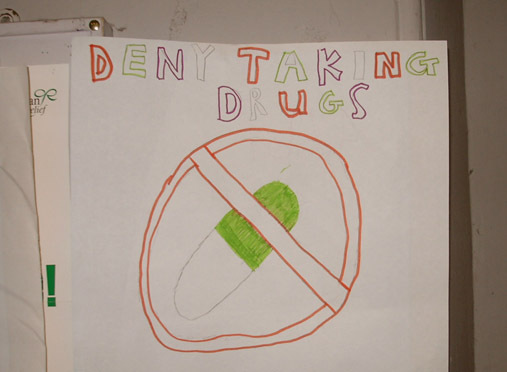 I don't think that "deny" means what this child thought it means. While browsing around the freezer section of my local supermarket, I came across this evidence that it may indeed be grim Up North. 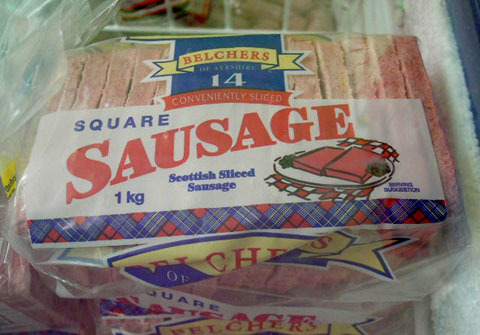 The idea of eating a one-kilo block of cheap sausage meat is enough to give me headaches. I wonder how many people have in ignorance tried to cook the slices in a toaster. Of particular amusement was the "serving suggestion" which shows two slabs of sausage meat on a plate with sprigs of parsley for salad. On top of all this, is the name of the manufacturer: Belchers. Scotland can be proud. What letter do you think is missing? W or S? Note that you can just see the ghost of a previous attempt to write the right-hand word behind it. 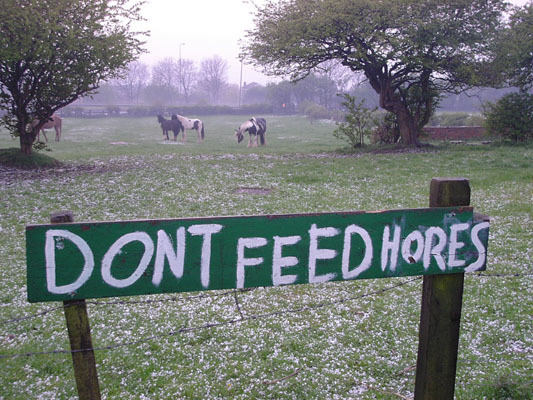 It seems that the word "HORES" was an improvement over the first attempt. Here you see proof that life in Britain is opulent and lush by comparison with the Spartan existence of people in the cold north. This is the front of a packet of crisp-bread from Finland. 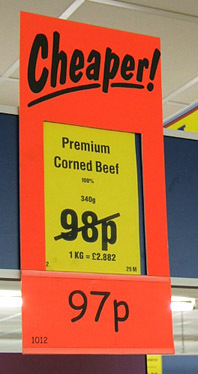 Whereas on a British equivalent the serving suggestion pictured would involve a sumptuous hunk of tempting cheese smothered in dark glistening pickle and garnished with bright fresh sprigs of herbs, here we see that Finnish customers are reassured by a picture showing that there is little sinful pleasure to be derived from eating the contents. A miserly shred of hard cheese adorns the left-hand piece, and on the right is a derisory smear of butter that speaks to me of long hard winters and slow ticking clocks. In the background, you may see that this meal is to be washed down with a small glass of water. Even the plate on which the crisp-breads rests makes it clear that this is all the eater is getting, as there is no room for anything else on this flat glass slide. 18% fibre, and 100% pleasure-free. While attempting to shake off some enemy agents, I ducked into the London Trocadero, and there I took this shot as I ran past the dodgems. I think that the sign-painter probably did this deliberately. You can see the attempts by the management to right the situation, first by adding a little piece of tape indicating the required height, and then by adding the "120cm" sign above, but one day I suspect that this sign will be repainted. Pretty much everything about this poster I find remarkable. Just how many people, I wonder, are there in Newcastle who think that they might be gay or bisexual, and have a learning difficulty, and have seen this poster, and think that "Support Understanding Social Same as me Exciting Dynamic" is such a great name for an organisation, that they will make sure that they attend for two hours every third Tuesday of the month. I can't see people flocking to this one, somehow. 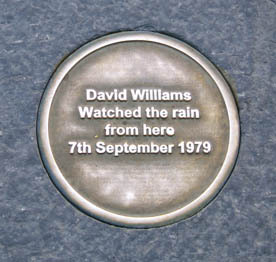 These plaques and others like them have been installed in the pavements of Newcastle. They chart and commemorate the city's rise to greatness. 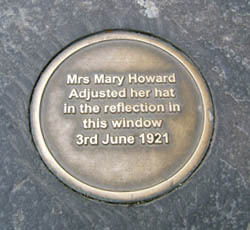 I think it important that the public be reminded of such pivotal events, and that heroes be acknowledged. 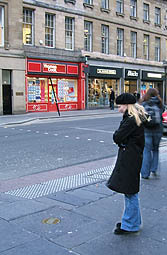 Here you see a passer by contemplating the significance of the spot on which she stands. 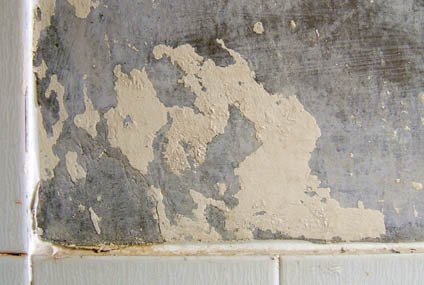 This is a formation of peeling paint that occurred naturally in my bathroom. What do you see there? I see an old lady, leaning forwards, walking into the wind, pointing a brolly ahead of her to shield her from the gusts. She is depicted in the art nouveau style, and dressed in clothing of the era circa 1905, with a feather in her hat, a long dress with perhaps a bustle, long dangling earrings, and a fur muff round her left wrist. She seems happy, even though she has lost her lap dog (or is that it just in front of her, licking at her feet with its tail in the air?). What is this? I've been cycling past it for years on my way across the Town Moor. 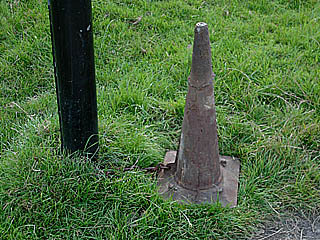 It is the size and shape of a traffic cone, but it is made out of iron. It is chained to a lamp post. This chain is not the only thing that would stop someone from sprinting off with the item, because the iron is half an inch thick and the thing weighs enough to punish a would-be thief with an instant hernia. If you know, please tell me. 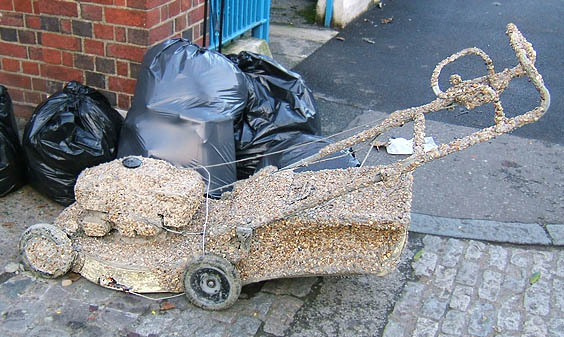 It's a pebble-dashed lawn-mower. 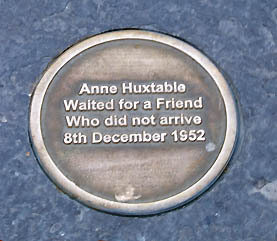 I was walking along in London, and saw that someone had put this out with the rubbish. It seemed that they no longer had any need for it. I supposed it seemed a good idea at the time. They were doing a bit of pebble-dashing, had some of the mixture left over â€“ "Anything else you want pebble-dashing while we're at it?" "Yes, why not try the lawn-mower â€“ we have to keep up with the Jones's." Alas, fashion is fickle, and their lithic-encrusted grass-shearer was soon cast aside as all the cutting-edge of gardening fashion moved on to fur-trimmed strimmers. So the toilet doesn't work, but they want me to use it anyway? Why did they disable it? And Why the random Capital letters? The people who wrote this sign really didn't think it through. 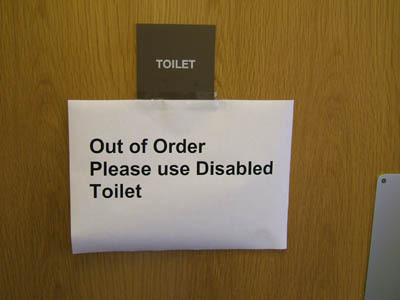 It annoys me when instead of fixing a disabled toilet, they sometimes instead put up a permanent-looking expensive sign saying 'Disabled Toilet'. I've also seen signs to "Accessible Toilets", suggesting that the other loos are for some reason located on the sides of cliffs or the ocean floor. 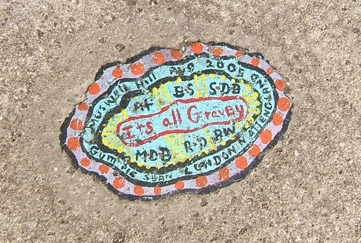 Another daft thing I've seen written is on a road surface in big letters: "Invalid Parking". If you're not allowed to park there, why do they mark out parking spaces? Just to tempt you into parking invalidly? Now this sign is just great. I wanted to make another one pointing to the left saying "THAT WAY". 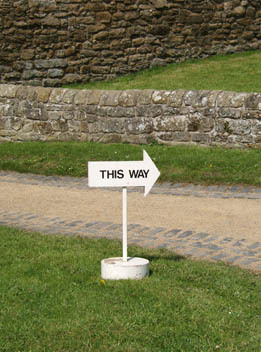 I saw it at Aydon Castle in Northumberland, and I have no idea what it meant. The car park was to the left, as was the exit, so obviously they weren't 'this way'. Come to think of it, the gift shop was to the right, so perhaps that was the purpose of this sign. Another good sign for people to orientate themselves by would be one pointing upwards with the word "UP" on it, although I suppose the mischievous might be tempted to have such a sign point not directly upwards, but at an angle, in the hope that this might make some people fall over. Posters outside a cinema in Stockholm. If you need this one explaining to you, then you don't know your cockney rhyming slang. 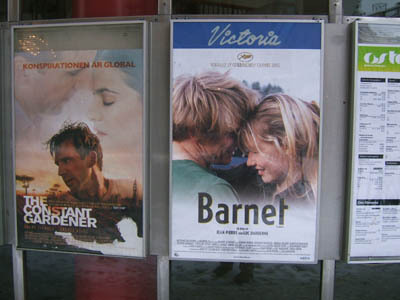 Barnet in Swedish means 'child', but Barnet Fair becomes 'hair' in London, and a 'barnet' generally refers to a haircut, especially a bad one, and the poster prominently features a couple of barnets. I saw this in a supermarket. 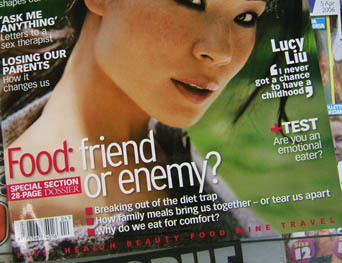 It is the cover of a women's magazine. All the minor headlines promise articles of drivel, but the main headline is a contender for the stupidest headline ever. This would be a lot funnier if so many people didn't fail to see the funny side, but instead took such nonsense seriously. Without food, you die. I spotted this in a church in Berwick, next to the nativity scene. 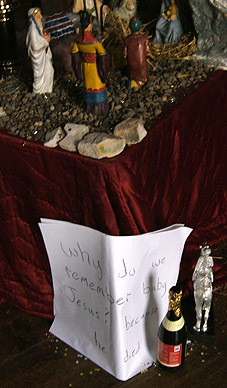 "Why do we remember baby Jesus?" 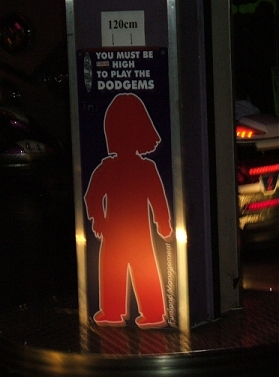 asks the sign, to which a child (I presume) has answered "because he died." Sale of the bleeding century! I stocked up with as much as I could carry. Seen in a museum gift shop. 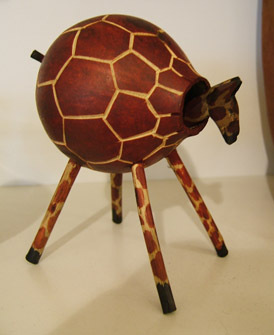 What are the two chief traits of a giraffe that a sculptor must capture, would you say? Slimness? Length of neck? Yes, probably those two. Every year, hundreds of people die by walking into Christmas trees. Steps can be taken to make these lethal devices safer, such as filing all the needles blunt, but it's best to cordon off trees with a stout metal barrier, and preferably only look at them through dark glasses. Have a merry Christmas, everyone, but please do try to be safe at all times. 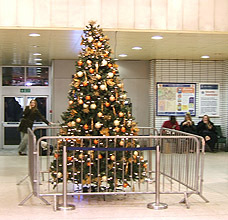 This example tree was seen in King's Cross Station, London. 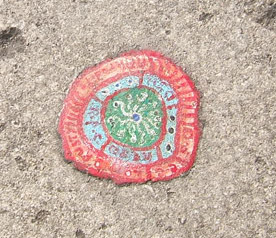 Evil people in the world drop chewing gum onto the pavements. 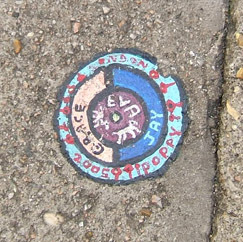 In Muswell Hill, London, an artist has gone around decorating the patches of gum. Here you see three examples. In a shop in Durham, I saw the answer to so many women's prayers. 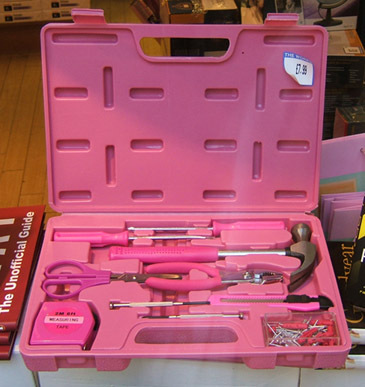 Women, you see, cannot do DIY under normal circumstances, because DIY tools are not pink. 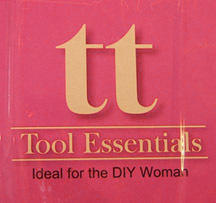 The thoughtful people at TT Tool Essentials, though, have produced a set with a pink hammer, pink pliers, and pink screwdrivers, enabling for the first time women to take part in the home DIY revolution. In time, this liberating technique might also be applied to lawn mowers and guns. 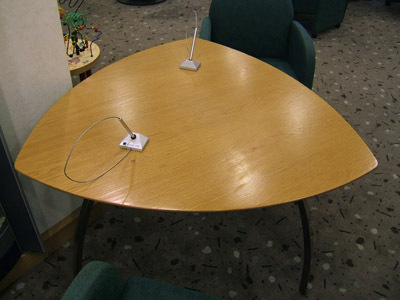 In the Gosforth branch of Lloyds TSB Bank, is this table. I used it once and immediately spotted that it was rubbish. Tables are normally rectangular, and you might think that it is difficult to go far wrong in their design, but you see in this case a designer got involved, and one thing one can be fairly sure of, is that a designer will find a way of designing something very badly. The pens are fixed on permanently. I, like most people, am right-handed. You cannot sit comfortably to the left of the pen because you are on the leg of the table, and right up against the wall. If you sit to the right end of the table, then again, you are hindered by the leg, and the pen won't reach the paper you try to write on. If you sit in the middle, then you have to set your papers off to the right, and the pen just reaches, but it is very awkward, because the cable on the pen lies across your page, and it is quite substantial, so the further to the right you write, the more the cable drags. It is a small table, but a table this size should be adequate for filling in a form in a bank, but the efforts of a designer rendered it almost perfectly useless. I saw this in the loos of a restaurant in Durham. It is a hand-drier â€“ the type that blows hot air. Now, it has become fashionable to spot badly-placed apostrophes and as this is a fashion of which pedants such as I approve, I am glad to do my bit. Indeed, it is heartening to find that pedants are so common. You see that this drier is the professional's choice, but which professional? Only one was involved. Was he the company's accountant? Not its proof-reader, one hopes. Possibly, there are people (or at least one person) who makes a living as a professional hand-drier chooser, but this seems unlikely. Even if the apostrophe had been placed in the right place, though, this would still have been a stupid thing to write on a hand-drier. Does anyone believe in or care about the notion that a certain hand-drier might be favoured by barristers and architects? This is a photograph of the back of a packet of role-play floor plans, snapped in a game shop in Newcastle. The packet had in it lots of nicely-painted pieces of card designed to be used with games like Dungeons and Dragons, set in medieval worlds with warriors and beasts. Each floor plan piece was double-sided, one side depicting a scene by day, and the other by night. This was a nice idea, but methinks that the artist was probably brought up in a modern city, and hadn't given much thought to the realities of the rural medieval world. You notice that these quaint ye-olde buildings are equipped with lots of street-lighting. Not only is there street lighting, but this lighting shines light downwards. How could this be done with medieval technology? How many servants would it take running back and forth to keep so many fires burning so brightly? How many passers by would be convenienced, and would it be worth conveniencing them? 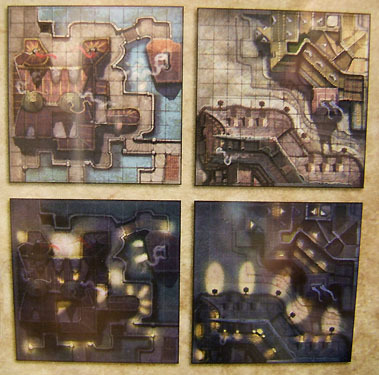 A well-meaning reader wrote in to suggest that these floor-plans were in fact designed for Cadwallon, and that this is a game-setting with a steampunk technology base, and so if used in that context, the downward lighting could be explained by some cunning gas-powered lighting contraption. 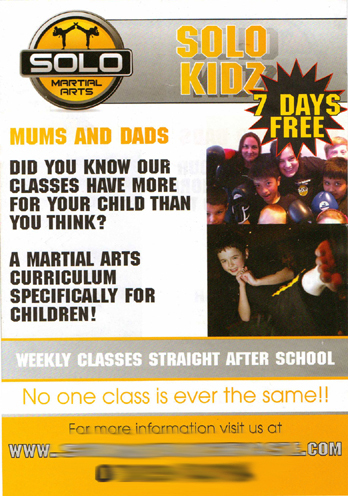 The name: 'Solo Martial Arts' does not make a great deal of sense. Can you imagine the advertisement now? [Gravel-voiced man] "Solo Martial Arts - for the man who fights... even when he's on his own!" The logo shows two men kicking each other in the foot, which is both a bit painful, and in this context numerically inappropriate. They say that the classes are weekly, and offer "7 days free". So, is that one free lesson? That they boast that their children's lessons are specifically for children is of questionable value, but the statement "Did you know that our classes have more for your child than you think?" is extraordinary. One possible meaning of this would be "Was there a time in the past when your opinion of how good our classes could be for your child was greater than it is now?" In other words, "Has your opinion of classes declined over time?" Another possible interpretation is that there is a weird logic loop here - something like: "Do you know more than you know?" The line that I prize above all others, though, is the priceless "No one class is ever the same!!" Presumably they meant to say "No two classes are ever the same!" Can something not be the same as itself?